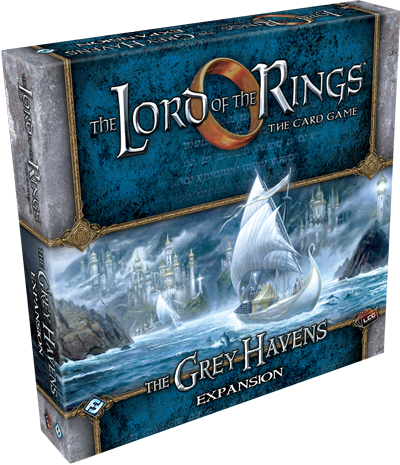 Fantasy Flight Games is proud to announce the upcoming release of The Grey Havens, the fifth deluxe expansion for The Lord of the Rings: The Card Game! 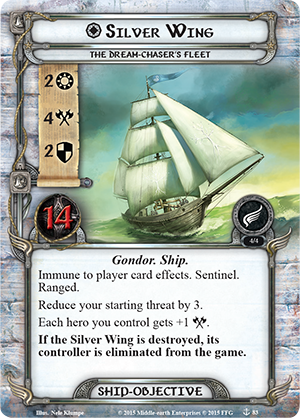 The Grey Havens and its 165 new cards allow you to adventure along the westernmost edges of Middle-earth, and then travel even further west… across the uncharted waters where the proud hosts of Númenor met their doom many long generations back. Three new scenarios feature mechanics for ships and sailing, as well as a heavy emphasis on exploration. Then, even as the troubled dreams of one Gondorian nobleman spur you to undertake an epic journey to the ruins of Númenor, The Grey Havens casts you deep into turbulent waters where Corsairs, Raiders, Undead, and the seas themselves pose constant threats. Additionally, two new heroes appear in The Grey Havens, as well as new allies, events, and attachments for each sphere of influence. These support the expansion's nautical themes and continue to develop the different themes first associated with the Noldor trait in the Angmar Awakened cycle, adding more cards that grow in strength as other cards are added to your discard pile. Finally, the twelve encounter sets in The Grey Havens establish a new tone for The Lord of the Rings: The Card Game, as its new enemies, locations, and treachery cards transport you to a new region of Middle-earth. As you adventure on the high seas, you'll experience ship-to-ship combat, fight back boarding parties, explore uncharted isles, and struggle to guide your ship through dark storms and massive waves. More than that, these new encounter sets lay the foundation for the upcoming Dream-chaser cycle of Adventure Packs. Ever since I first read The Lord of the Rings, I have been fascinated by the Elves of the Grey Havens and the oceans of Middle-earth. I love the beautiful and sorrowful imagery that accompanies those Elves who sail to Valinor, never to return. These ideas prompted me to wonder what would happen if our heroes went on a sea voyage of their own, across the seas of Middle-earth. What adventures would they share? What challenges would they face? As I pondered these questions, they led, ultimately, to the development of The Grey Havens and the accompanying Dream-chaser cycle. Very early in development, the team recognized that sailing needed to feel different from walking overland. To that end, The Grey Havens features new rules for Ships and Sailing that help drive the feeling of navigating the high seas. 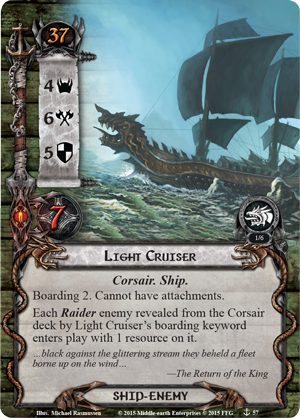 Ships are a new card type in The Grey Havens, appearing as both objectives and enemies. At the beginning of each scenario in which the players are sailing, each player chooses and takes control of one of the four Ship-Objectives included in this expansion. (In a game with only one player, that player takes control of two Ship-Objectives, instead.) These Ships represents the vessels on which all of your characters are sailing, and each Ship boasts stellar stats along with a powerful ability. However, each Ship is immune to player card effects, and if any player's Ship sinks, that player is eliminated from the game. 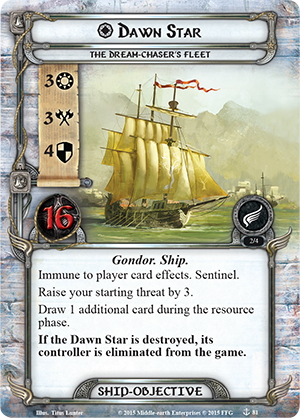 As an example of what these Ships offer, the Dawn Star (The Grey Havens, 81) has good Willpower and Attack, excels at Defense, and gives its controller an additional card every turn. The Silver Wing (The Grey Havens, 83), on the other hand, has poor Willpower and Defense, but great Attack, and is the only Ship that features the Ranged keyword. It also boosts the Attack Strength of each of its controller's heroes, and lowers that player's starting threat. The choice of which Ship you sail will have a huge impact on your experience, and adds to the replayability of these scenarios. Even though your Ship has fantastic stats, it will only ever act once each turn – to quest, attack, or defend – so how you decide to use your Ship is extremely important. Making this choice even more difficult is the existence of Corsair Ship-Enemies, like the Light Cruiser (The Grey Havens, 57). Not only is this Ship enemy a massive threat, but it always comes with additional enemies thanks to its “Boarding” keyword. This keyword represents the individual Corsairs battling your heroes and allies on board the two grappled ships. Your Ship can only defend against enemy Ships (and is, in fact, the only thing that can defend against enemy Ships), so if you are engaged with a Ship-Enemy and use your Ship to quest or attack, you’ll find your Ship taking tons of damage! Carefully managing your Ship’s actions and learning when you can afford to risk a little damage to your Ship are the keys to defeating these powerful enemies. 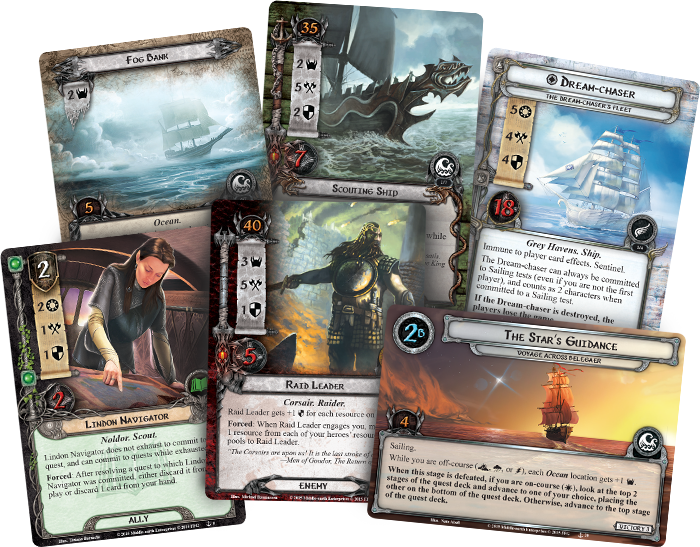 Of course, the most important thing is that these new Ship cards help immerse you in your quest and its narrative as you sail across the seas of Middle-earth. But Sailing isn’t the only thing players can look forward to in The Grey Havens. The overarching themes of this cycle are exploration and discovery, and you'll find that its scenarios also drive these themes home with new “Uncharted” locations. 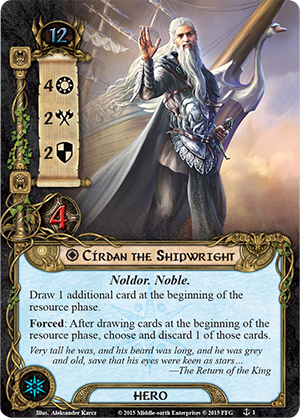 Finally, The Grey Havens also gives you your first opportunity to take control of Círdan the Shipwright (The Grey Havens, 1) and the Elves of Mithlond, who take the Noldor themes introduced in the Angmar Awakened cycle to the next level, introducing cards that increase in power with each copy of that card in the discard pile, and cards that grow more powerful depending on the card that's on the top of your discard pile! Beyond all this, there’s still a lot more to discover in The Grey Havens, and I can’t wait for players to learn more from upcoming previews and then sail the high seas in search of adventure! The call has come from the Grey Havens. Círdan the Shipwright seeks your aid in a matter that he senses is of the utmost importance. Will you answer the call? Where will one Gondorian nobleman's ominous dreams take you? Soon, the time will come to raise anchor and hoist the mainsail. The Grey Havens deluxe expansion is scheduled to carry you beyond the shores of Middle-earth in the fourth quarter of 2015. Until then, head to the crow's nest and keep your lookout for more previews and other news about The Lord of the Rings: The Card Game!